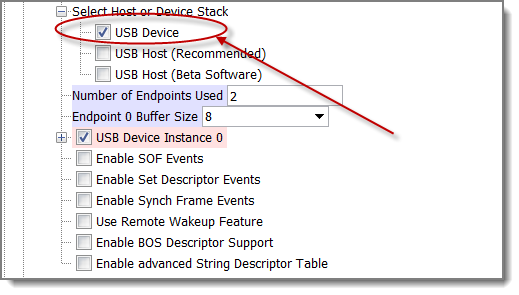 If USB Device is selected, MHC provides options for configuring the device. The configuration options include USB Device Instance 0 setup. Within the Device Instance Setup menu is the ability to number and configure a USB device's Functions. For each USB Device instance, MHC provides a pull-down menu containing the currently supported Device Classes. For each selected Device Class, source files containing APIs are added to the project.